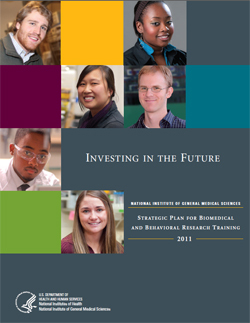 We have just posted the final version of Investing in the Future: National Institute of General Medical Sciences Strategic Plan for Biomedical and Behavioral Research Training. Fifteen months in the making, the plan reflects our long-standing commitment to research training and the development of a highly capable, diverse scientific workforce. In an earlier post, I shared the plan’s four key themes. As you’ll see, the plan considers training in the broadest sense, including not just activities supported on training grants and fellowships, but also those supported through research grants. It strongly encourages the development of training plans in all R01 and other research grant applications that request support for graduate students or postdoctoral trainees. And it endorses the use of individual development plans for these trainees as well as the overall importance of mentoring. Finally, the plan acknowledges that trainees may pursue many different career outcomes that can contribute to the NIH mission. My thanks to the dedicated committee of NIGMS staff who developed the plan and to the hundreds of investigators, postdocs, students, university administrators and others who took the time to give us their views throughout the planning process. We’ve already started implementing the plan’s action items. While there are some that we can address on our own, others will require collaboration. We will again be reaching out to our stakeholders, and we look forward to continued input from and interactions with them to achieve our mutual goals. 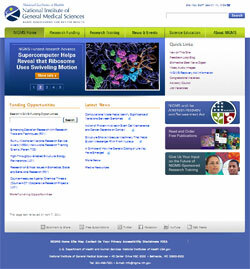 A new look and feel for the NIGMS Web site will launch in the next few weeks. The design incorporates feedback we received during usability testing with individuals representing key target audiences—scientists, administrators, educators, news media and the public—as well as from our recent user satisfaction survey and other data. The new design features a fresh color palette based on the NIGMS logo, fewer top-level tabs and a reorganization of how some content is presented. We also make it easier for users to connect with us through social media like Twitter and Facebook . Even with these latest enhancements, the site is always a work in progress. We welcome your input and suggestions at any time. UPDATE: The redesigned NIGMS Web site has launched. While redirects are in place, please be sure to check your bookmarks as some page URLs may have changed. An exceptional array of structural biologists, cell biologists, virologists and other researchers gathered at NIH late last month to discuss achievements, applications and future directions in AIDS-related structural biology. The group was attending the 25th Annual Meeting of the Groups Studying the Structures of AIDS-Related Systems and Their Application to Targeted Drug Design. I was extraordinarily impressed by the quality of the science, the passion with which it was presented and the interactive culture of the community. The meeting began with a keynote address by Steve Harrison of Harvard Medical School. He provided valuable historical perspective and then outlined major challenges facing the field. Two days later, the event concluded with a provocative talk by Manuel Navia of Oxford Bioscience Partners about the economics of bringing new lead compounds through the drug development pipeline. In between were sessions on the HIV life cycle, HIV host-pathogen interactions, imaging, latency, viral host recognition and structure-based drug design and resistance. There were also lively poster sessions showcasing more than 70 projects. Approximately 2.8% of the NIGMS budget supports research related to AIDS, which includes individual grants, program projects, centers and institutional training grants. A major focus of our current AIDS-related structural biology efforts is three P50 Centers for the Determination of Structures of HIV/Host Complexes. 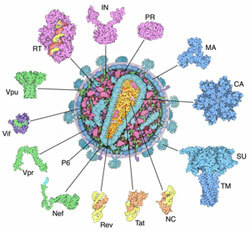 With cofunding from the National Institute of Allergy and Infectious Diseases, we support the Center for HIV Protein Interactions at the University of Pittsburgh; the Center for the Structural Biology of Cellular Host Elements in Egress, Trafficking, and Assembly of HIV at the University of Utah; and the HIV Accessory and Regulatory Complexes Center at the University of California, San Francisco. These centers use a comprehensive, collaborative approach that engages the larger biological community involved in HIV-cell complex research. Because the funding initiative for the P50 centers expires next year, we solicited feedback on the program from meeting attendees. We also asked them about emerging scientific opportunities in the field and the best way to move forward. We welcome your input on these topics, too. We’ll talk more about future of NIGMS AIDS-related funding opportunity announcements at the May 2011 meeting of the National Advisory General Medical Sciences Council. Although many scientific questions remain, the 25th anniversary meeting underscored how basic research on the structure of HIV-1 and interacting host proteins has significantly increased our understanding of virus biology and informed structure-based therapeutic approaches.